Exploring Japan returns to the Kanto region with Gunma Prefecture. Gunma has a slowly decreasing population, similar to many other prefectures. Takasaki Castle in Takasaki has very little remaining. But it’s apparently worth seeing some of the remaining buildings. Numata Castle in Numata also has very little remaining. There are some buildings, but not much left. The only major professional team in Gunma is the Thespa Kusatsu Gunma soccer team in the J-League. There was a team in Takasaki, but it had financial problems. When I think of Gunma, I think of two things, both of them hot. First is the hot weather in the southeast, near Saitama. It’s one of the hottest parts of Japan. The other is hot springs. In particular, the town of Kusatsu and its hot springs resorts. In Maebashi, the capital, there isn’t really much to see or do. You could watch soccer or take in a 360 degree view of the city at the Gunma Prefecture Governmental Building or see the Ogo Gion Festival. Takasaki is more interesting than the capital. It’s the home of the Daruma doll. Shorinzan Daruma Temple is the origin of the Daruma dolls, and it has a small museum. Mt. Kannonyama has a big Kannon statue at the top, as well as a cave and garden. For those who like history, Zenpou-Kouen-Fun has a lot of keyhole tombs that are 1500 years old and an archaeology museum. Gunma no Mori has a couple of good museums. Mt. Haruna has a very old shrine, as well as a scenic crater lake and the top of the mountain can be accessed by bus. Minowa Castle ruins are also in Takasaki. Tomioka city is also worth visiting for its silk history. It has Japan’s oldest modern silk mill. You can also see the Gunma Safari Park and the Tomioka Museum of Natural History, which has 30 dinosaur skeletons. Kiryu has some great old architecture dating back to the Meiji era. It seems like it’s a great place to walk around. Nearby is the Watarase River valley, which is considered Japan’s Grand Canyon. Great place for hiking and seeing the gorge. There’s also a 400 year old copper mine that you can see. The city is also well known for silk and pachinko factories. Ota city is known as Japan’s “Little Brazil,” as there’s a large Brazilian population. Also, Subaru’s headquarters are here. Some things of interest are Daikoin Temple, as well as the remains of Kanayama Castle. Also, the Yabuzuka Onsen is the local hot springs, but nearby is the Snake Center, which has a collection of rare snakes. Tatebayashi is a city that’s pretty close to Saitama in the far southeast. You can see the Tatebayashi Castle ruins there. But it’s also well known for azaleas, which can be see at Tsutsuji-ga-oka Park. Morinji Temple is home to “Bunbuku Chagama,” tanuki tea kettles. Kusatsu is a small town, but it’s very famous in Japan. Yabutake, a huge hot spring resort, looks very interesting. There are more than 100 hot springs, plenty of museums, flowers, lakes, mountains, and a ski area. It’s very popular to go there during winter to ski in the daytime and relax in the hot springs at night. Mt. Kusatsu-Shirane is an active volcano that you can take a tour of, and it has a crater lake. It’s in Joshinetsu Kogen National Park, Japan’s second largest. Asama Volcano Museum is a good place to learn about volcanoes. Tropical Wonder Land has a lot of tropical animals. Gunma is famous for wheat and other agricultural products. One popular food is udon. The prefecture is also well-known for cabbage, negi (long green onion), and konnyaku (konjac). This picture shows just how beautiful it is right now. 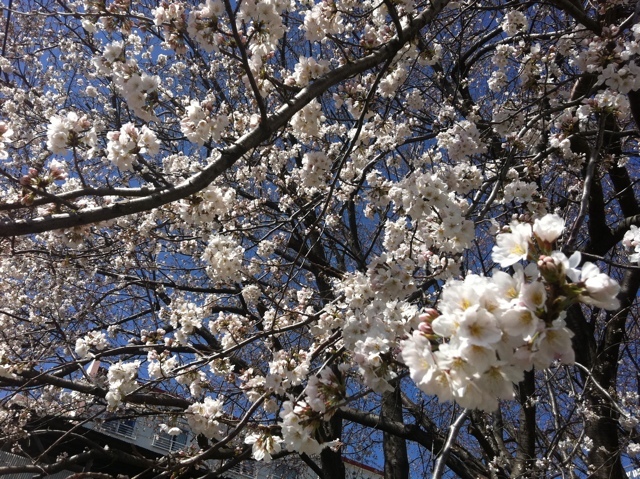 There are some trees that are nearly in full bloom, but most are still just starting out. Next week, the trees will be in full bloom. It’ll be great for pictures! Where did Yokohama Station go? It’s under some kind of cover. Is it getting a renovation like Tokyo Station? No way. 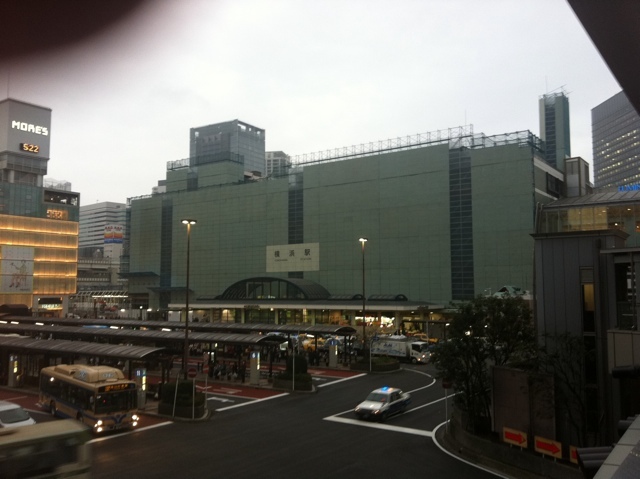 Yokohama Station isn’t that historic. The original Yokohama Station is actually Sakuragicho Station now. What they’re most likely doing is cleaning the outside of the building. In Japan, when buildings are being cleaned, they put up scaffolding and hide the entire thing in a green or blue fabric. Sorry about my finger getting in the way. It was a very windy day and hard to hold my phone. A fuzzy blob is coming down to destroy Yokohama Station! Oh, that’s just my finger. Exploring Japan returns with a look at central Japan’s Gifu prefecture. Gifu is one of the prefectures that is shrinking in population as people move to the big cities. Gifu Castle in Gifu city is a reconstruction of the original. The castle contains a museum and the observation deck provides a 360 degree panoramic view of the city. It’s located at the top of a mountain, so the view sounds amazing. Gujo Hachiman Castle in Gujo is a wood reconstruction built in 1933. It’s a pre-war reconstruction, which seems unusual. It’s also a mountaintop castle. Ogaki Castle in Ogaki is a reconstruction of a castle that was destroyed in World War II. The interior is a museum with artifacts from the Battle of Sekigahara. Sunomata Castle in Ogaki is a reconstruction. It serves as a local history museum now. Gifu is famous for quite a few things, actually. Some of the most famous things in Gifu include the historic village Shirakawa-go, cormorant fishing, and for people who love science, the Super-Kamiokande and KamLAND neutrino and antineutrino experimental facilities. It’s a popular place for skiing, hiking, and hot springs, as well. In Gifu city, you can see Ukai, or cormorant fishing. They use cormorants to catch fish. In addition to Gifu Castle, Mt. Kinka is a good place to hike. As for museums, I’d like to see the Gifu City Museum of History, Nawa Insect Museum, and Gifu City Science Museum. Gifu has its own Daibutsu (Great Buddha), as well. The Nagara River Fireworks Festival lasts 90 minutes at the end of July and beginning of August. Hida city is a very historic city with a preserved historic city centre. Mino is well-known for its Mino-washi Akari Art Exhibition, which is a paper lantern festival. Tajimi is a great place to see ceramics. Also, Eihoji temple is a beautiful Buddhist temple. Takayama is a city that has some great historic sites. The Hida Folk Museum (Hida Minzokumura) is an open air museum that has Edo period buildings and people performing traditional jobs. The Takayama Festivals are one of the largest Shinto festivals in Japan. Takayama Jinya is a beautiful old government building that is open to the public. Yoro has a very unique attraction, The Site of Reversible Destiny in Yoro Park. It’s a theme park designed to disorient you. Sounds very interesting. Gero is famous for its hot springs. Gero Onsen is one of the most famous hot springs in Japan. The Oku-Hida Onsen Villages are a great place for hot springs and hiking with beautiful mountain views. Sekigahara is famous for its battle in 1600. There are some museums dedicated to the battle. Gifu is best known for hoba miso, a soybean paste that’s grilled on a hoba leaf. Also, you can find Hida beef, which is a marbled beef that is very expensive. Do you live in Gifu, or have you visited Gifu? What else is great to see there? It was a grasshopper, and boy was it ever big. It was about 4 or 5 cm long! 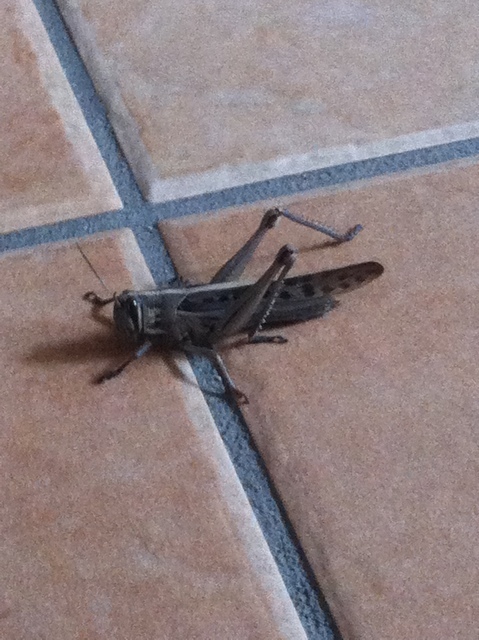 I’d never seen a grasshopper that big before. I’ve mentioned before that Japan has a lot of large, creepy animals. I just hope I don’t run into a Huntsman spider. Anyway, Exploring Gifu will be coming tomorrow night. Today, as I was going shopping, I happened upon a pleasant surprise. 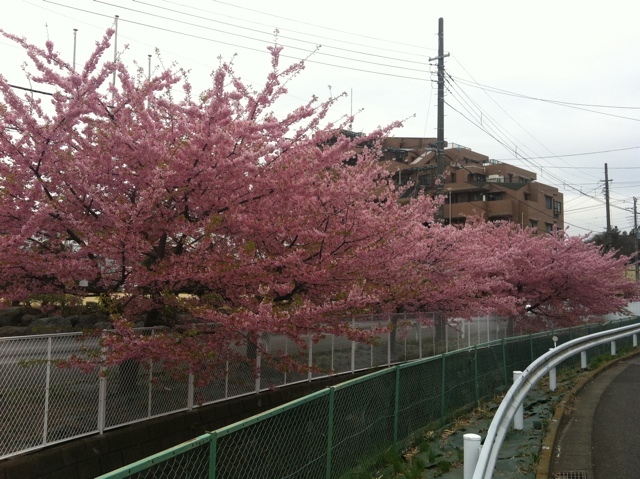 It was Kawazuzakura, or Kawazu cherry trees. This variety is from the Izu Peninsula of Shizuoka, and is a bright pink. It blooms from late February to mid-March. Very nice surprise, don’t you think? In case you’re wondering where Exploring Gifu is, I’m not doing it this week. Don’t worry, it’ll be done this coming weekend. I’m taking an off week. While this is a weekly series, there are only 47 prefectures. The first week was an introduction to this series, so that would be 4 weeks in which there’s nothing to post. I’d originally decided to do the 4 largest cities in Japan. However, I’ve changed that plan. I’ll be doing Tokyo over 2 weeks (a week for western Tokyo, a week for 23 Wards Tokyo), while the other 3 weeks I’ll treat as off weeks. I’m taking my first off week now. The reason for this is that over the past week, there’ve been a few obstacles set against me. The record-breaking pollen levels in the Tokyo area have affected me very strongly. On Thursday and Friday, I actually felt quite sick. I’d thought it was the flu, but it was just my allergies. I planned to do the work on Gifu over the weekend, but my daughter was having problems sleeping, as well. She was crying constantly for several nights until finally falling asleep around 2 or 3 am. To make a long story short, I’ve been exhausted, felt like crap, and had no motivation or time to work on any of my blogs. After this, I hope to return to normal. I can’t wait for the end of allergy season.